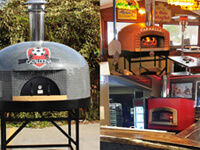 Have some general questions about Forno Bravo Pizza Ovens and the purchasing process? We’re here to help. Select a question below to get a quick answer and find out where to learn more information. 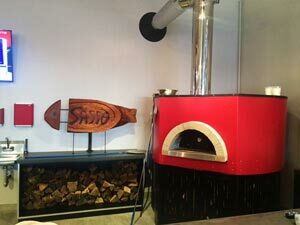 How do I buy a Forno Bravo Pizza Oven? 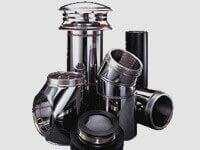 Work with one of our Dealers, who can also help with installation and added services. Learn More about Ways to Buy. How do I decide which oven is right for me? Are you looking for a residential or commercial unit? How much space do you have available? Any access issues? Would you like something you assemble yourself, or something fully assembled? Will this be for indoor or outdoor use? Would you like your oven to be gas compatible? How many people will you cook for on average? 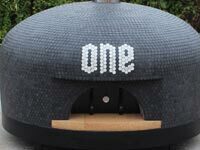 Would you like to customize your oven’s exterior color or tile pattern? Need more assistance? You can also Contact our Support Team for questions and quotes. 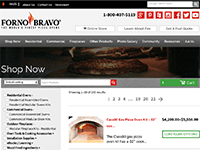 Why Forno Bravo -- what makes our ovens special? 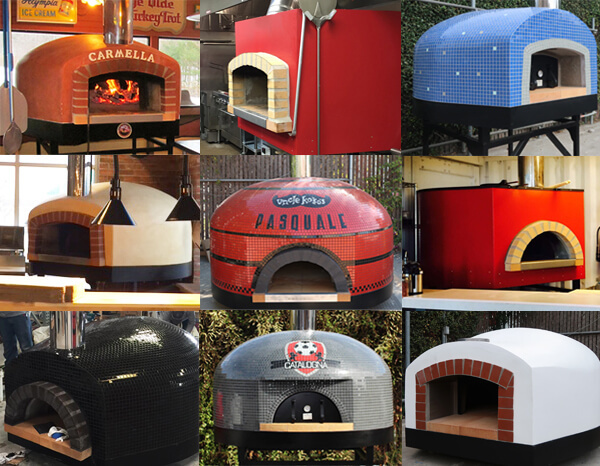 Advanced engineering and extensive building experience go into every Forno Bravo oven to make them durable and efficient. 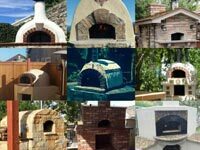 Based on time-tested Italian brick oven designs, but upgraded and made in the USA by in-house craftsmen to ensure quality construction/materials, and contain costs, these ovens are innovative works of beauty and functionality. Several of our larger models, and all gas models, are also UL Certified for safety standards you can trust. 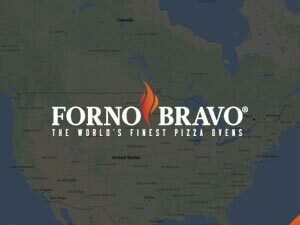 With Performance – Quality – Customization – and a Supportive Community, the question isn’t “Why Forno Bravo,” but “Why not?” You won’t be disappointed! Learn More about our Core Technologies and Features. 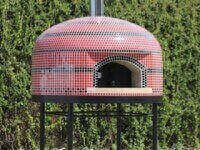 How do I get custom colors and designs on a tiled oven? 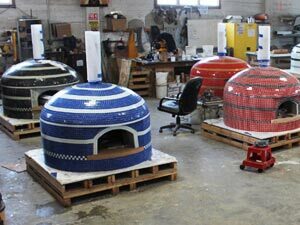 All of our tiled ovens are assembled in-house by hand. 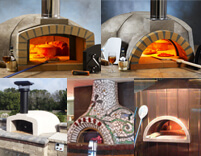 This gives us the flexibility to help make your oven uniquely yours! Your Sales Rep will be happy to go over the options and costs with you. Our standard line of tile is from the DalTile’s “Illustrations” brand of mosaic tiles. Not the style of tile you are looking for to fit your decor? Additional tile colors, customization, and materials are available upon request. Logos or text can also be added for an additional cost. Just send us your logo, design, or color combination for an estimate, or have our talented staff help. Try us. Our artisans love a challenge! 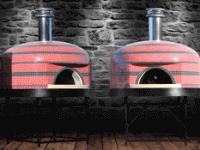 See a sample of our Custom-Tiled Ovens in our Photo Gallery for inspiration. 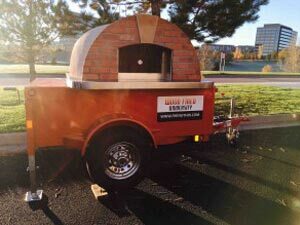 For our Commercial product lines and Bella Mobile Trailer, Forno Bravo works with QuickSpark Financial Services to provide small cap financing options at competitive rates. All data shared with QuickSpark is confidential; Forno Bravo is not privy to your financial information. 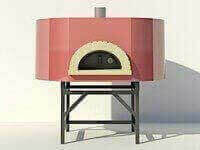 Financing for Residential ovens is not available at this time, though we are exploring possible options. Learn More about Commercial Financing. 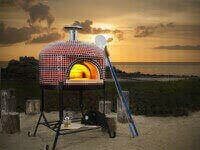 I’ve ordered my Residential Oven. Now what? Congratulations on choosing your new oven! Customer Service will send you an email with the order details to verify the order is correct and establish an approximate ship date. 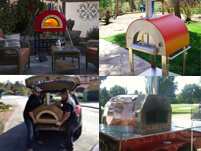 The next steps are to have your oven delivered to you and moved into place. If your oven is more than 2,000 Lbs you will need to arrange for the appropriate equipment to unload your oven. 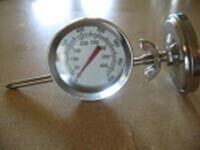 Click here to find your oven’s shipping weight and necessary equipment for unloading. On the day your oven is set to ship, you will receive a courtesy call from our shipping coordinator informing you that your oven is scheduled to be picked up via LTL carrier. 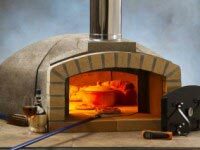 The day after your oven has shipped, you will receive an email with the following information: Shipping company and contact, tracking number, and trucking live website information. You will also receive a pdf document with installation, curing, and claim instructions. Please allow 3 to 8 business days for delivery. Once your crate arrives*, inspect it carefully BEFORE the driver leaves. If there is any damage to the crate, you must note it on the Bill of Lading that the LTL driver will ask you to sign. 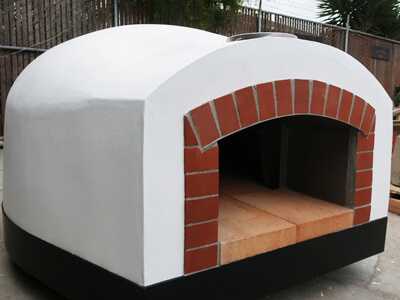 If there appears to be significant to the crate or oven, take photos and immediately contact Forno Bravo via phone (1-800-407-5119) or email Tech Support to file a claim. Extra note for kit buyers: If you have ordered a kit, be sure to save the insulation that comes in the crate! It is not packing material, but an integral part of the oven. Also, do not store supplies for an unfinished oven outside untarped. 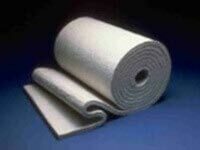 You need to keep the insulation and mortar dry. Your oven will arrive on a flatbed truck. Depending on how you intend to move it into position at your home, it will need to be off-loaded with a fork truck or a crane. You will need to make arrangements for this equipment. Learn More about Receiving Your Oven. 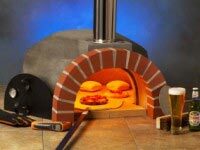 | Learn More about Installing a Countertop Oven. 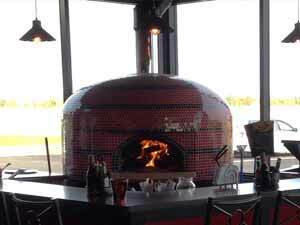 I’ve ordered my Commercial Oven. Now what? Move the oven into place. Extra note for modular buyers: If you have ordered a kit or knock down version, be sure to save the insulation that comes in the crate! It is not packing material, but an integral part of the oven. Also, do not store supplies for an unfinished oven outside untarped. 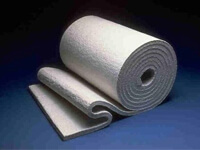 You need to keep the insulation and mortar dry! Your oven will arrive on a flatbed truck. Depending on how you intend to move it into position, it will need to be off-loaded with a fork truck or a crane. You will need to make arrangements for this equipment to be on hand. 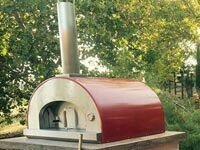 What is the lead time to ship my oven? For an exact lead time, please Contact Sales Support for a specific quote. What kind of venting do I need? 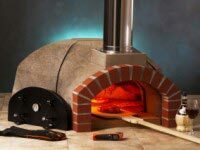 Good venting is critical to the performance and safety of your Forno Bravo pizza oven. 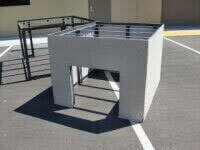 Venting needs are based on oven size, style, location, application (commercial/residential,) and local regulations. 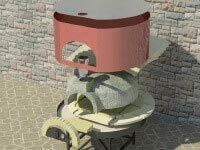 One basic principle to remember is that you can extend your chimney as far as needed straight up, but no more than two 30 degree bends (maximum) are allowed for safety and draw. Another important principle is to pay close attention to required clearances from combustible material to prevent fires! Please see you Owner’s Manual for details. We’ve created several informational pages to help you navigate your venting options. Additional reading is available at the bottom of each link, or you are welcome to contact Tech Support with a specific question. 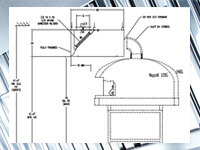 Learn More about General Venting Design. | Learn More about Type 1 Hoods. How do I build the base to support a countertop model? 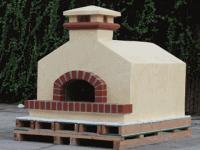 Refractory pizza ovens are built to last and are heavy! Be sure to build or use a base that is level and strong enough to support that weight safely. 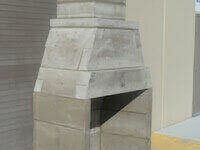 Bases can be made of masonry/brick, concrete, or steel. See your Owner’s Manual (Pg. 13 & 15-22) for minimum stand dimensions and instructions on building a foundation, and concrete block stand and hearth. 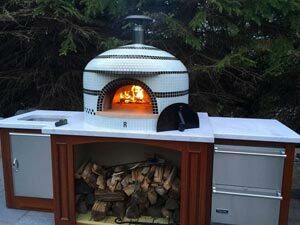 Want a jump start that can save you time and weight, and add confidence, safety, and integrated style to your outdoor kitchen? 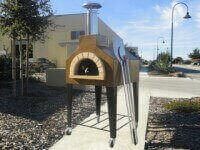 Consider using our DIY steel Cucina Stand instead of concrete blocks for your pizza oven support structure. Learn More about Cucina Stands. 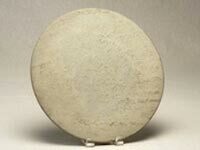 | Learn More about a DIY Concrete Block Hearth. What kind of wood should I use? How much will I need? 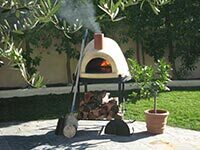 The best woods to burn in your Forno Bravo pizza oven are dry, seasoned hardwoods such as oak, maple, ash, beech, and birch. Other Community favorites are mesquite and citrus. Fruitwoods are also extremely popular for their heat and fragrance, including apple, hickory, almond, cherry, pear, and pecan. DO NOT use pine, fir, eucalyptus, or cedar, due to their high resin levels. 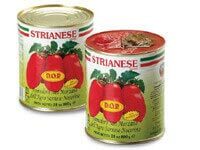 They leave a hard to remove residue in the oven and an unpleasant taste on your food. 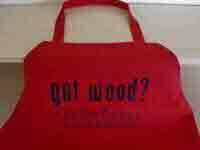 If you do choose to use a softwood (ex. pine or spruce,) properly cure and season it to reduce sap content. Remove the outer bark to also help reduce sap, moisture, and smoke. 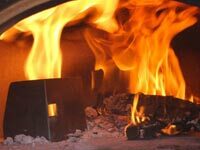 How much wood you will need varies on the size of your oven and how much food you are cooking. Small units will heat up to 800℉ with as little as 2-3 pieces of standard firewood (double split into smaller pieces for convenience.) 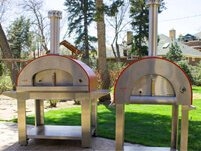 Large ovens will reach and maintain these temps and more with 7-8 pieces of wood. As a starting point, reference our Estimated Wood Consumption Guide. Do not over-fire your oven. Flames spilling out of the oven mouth or excessive temperatures are signs you are over-firing Avoid this! 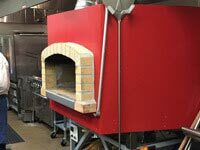 Our narrower oven mouth, interior dome shape, industrial-grade insulation, and high-tech refractory materials all help the heat to stay where it is supposed to be, in the chamber. 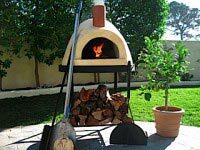 This reduces the amount of wood you will need to bake great pizza. Learn More about Choosing Firewood. If I buy a gas fired model, can I still use wood in it too? 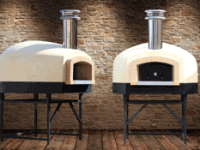 Learn More about Gas for Residential Ovens. 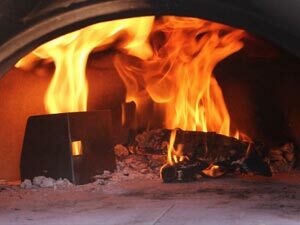 | Learn More about Gas for Commercial Ovens. It snows where I live. Can I use my oven in the winter or a cold climate? Do keep moisture out of your oven in general. 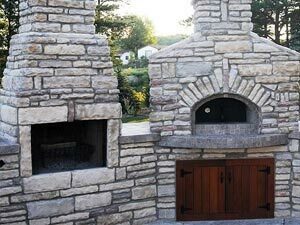 (For example, close the door when the oven is not in use to prevent rain and snow from entering and place the terracotta or steel cap on top of the chimney.) 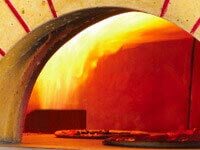 Moisture in the oven will seep into the cooking surface, and when fired, the water will release as excessive steam in the pizza oven. This can lead to a process known as “spalling,” that can cause pitting and hairline cracks over time. Truly, the only limiting aspect of winter use is your willingness to stand outside to light it! Once the fire is going, it is quite warm in front of it. 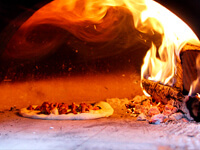 In below-zero conditions, fire your oven a little more slowly to give it more time to warm up. 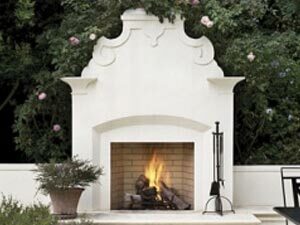 You will want to keep the open oven mouth out of the wind for temperature stability. A blowing wind and cold outdoor temps may mean you will need to adjust your fuel volume and cook times and be willing to experiment a bit. Winter cooking is an adventure, but a very delicious one! 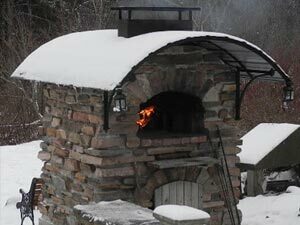 See our general Outdoor Pizza Oven for Winter Gallery or our Winter Photo Contest Gallery for inspiration! What else can I cook in my oven besides pizza? 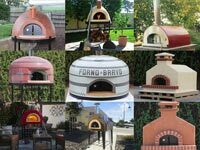 Forno Bravo wood fired ovens are extremely versatile. You can cook anything in them that you use your regular oven or BBQ for, plus a whole lot more! The heat you put into them with the fire is retained by the oven core and slowly released over time. It’s all a matter of fire management, food placement, and time. 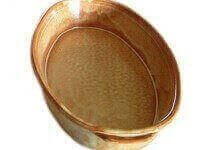 This allows you to bake, grill, sauté, roast, brown, seer, warm, and stew. Hearth bread, beef roasts, chicken, vegetables, flavored olive oils, and desserts are just a few options. 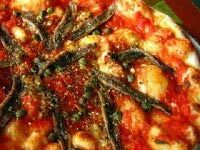 Plus you can make Vera Pizza Napoletana in 90 seconds. No Maytag or Weber can match that! Learn More about Cooking Styles. | Explore our Community Cookbook for great recipes to try. Why do I have to cure my oven? How do I do it? 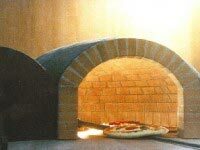 When it’s cast, your oven contains a high ratio of water to concrete that has to be baked out of the oven. 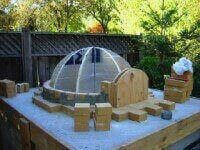 This curing process actually strengthens the dome, when done properly. 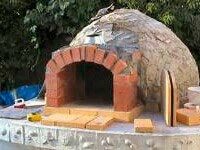 However, if the oven gets too hot too fast, then water seeks to escape the entire dome’s thickness all at once, and can result in damage, including cracking the dome. Curing is done low and slow — starting at a low temperature and building a series of increasingly larger fires over a 5-day period. Let your fires burn for 6 hours or longer each day. 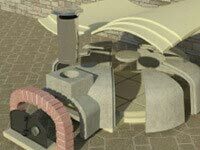 The first-day fire is no more than kindling and thin strips of wood for 300℉ at the top interior of the dome. Each day, increase the temperature of the oven by 50℉ until you are at 500℉ on day 5. Close the oven door every evening to preserve dryness and heat. Have patience and enjoy this bonding time with your oven, and it will reward you with many years of wonderful use in return! 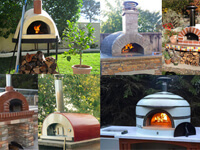 Learn More about Curing your Oven. | Contact a Sales Rep about our Pre-Curing Services. How do I maintain my oven? 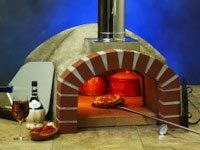 Forno Bravo wood and gas fired pizza ovens are durable and require very little maintenance. Here are few basic principles to keep your oven functioning at its best. General: Follow all curing instructions when you receive your oven. Keep water, snow, and rain out of the chimney and chamber going forward. Do not scrape sharp or heavy objects across the oven floor. Do not throw wood into the oven, or use inappropriate fuels. Creosote: At least twice a year, inspect the vent and chimney pipe for creosote build up. The oven can be inspected through the door opening when the oven is completely cool. If creosote has accumulated, it should be removed by cleaning the chimney, spark arrestor, and cap to reduce the risk of fire. See your Owner’s Manual for complete instructions. What is Creosote? Slow burning wood produces tar and other organic vapors that combine with expelled moisture to form creosote. Creosote residue accumulates on the flue lining and/or exhaust hood and can ignite into an extremely hot fire. Soot: Soot is a natural byproduct of wood fired cooking. Depending on your oven’s finish, you can clean the exterior of the oven using warm soapy water and a soft cloth or soft brush. The door should be closed to keep water out of the chamber. (Expect soot to return when you begin using your oven again.) 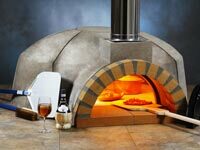 You can reduce soot build up by not over-firing your oven. 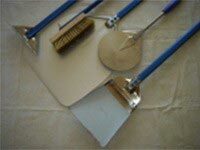 Tile Care: If you have a tile oven, it is important to reseal the grout every 1-2 years with a penetrating grout sealer. Glass tile can be cleaned using a glass cleaner and a soft, lint-free cloth. To remove soap scum or water deposits, a minimally abrasive cleanser and soft bristle brush can be used. Glazer Ceramic tile requires a slightly different method of cleaning. Contact Customer Service for assistance. 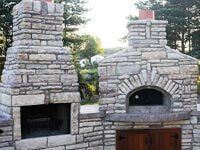 We also recommend covering your oven in outdoor settings during inclement weather for greatest finish protection. Ash: Remove the ashes from your oven before you light a new fire. Old, cold ashes will get in the way of food baking. Always store ash residue and old wood pieces in a closed container on a non-combustible surface prior to disposal. Do not dispose of ashes or coals until they are completely cool. 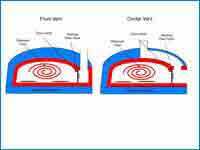 Gas Burners: Gas burners require minor, periodic preventative maintenance for best performance. For example, clean your burner nozzles every 6-8 months. Replace the igniter battery as needed. Flame breakers, nozzles, and the thermocouple probe may require occasional replacement. Please see your Owner’s Manual for complete instructions or contact Tech Support for specific questions. Find an Owner’s Manual. | Learn More about our Warranty Policy. Still have questions? Check out the following sections of the website for even more in-depth support or Submit Your Question to our Tech Team for support!